Imitation is the sincerest form of flattery,” says Charles Chamness, president and CEO of the National Association of Mutual Insurance Companies, referring to the rise of InsurTech startups like Lemonade and Friendsurance. The Lemonades of the world call themselves peer-to-peer organizations, but what they are essentially doing is applying technology to the traditional mutual model. “What they’ve described, and the concept that they sell, is basically policyholder alignment—no third party (i.e., stockholders) in the deal. A company that’s focused on its customer. These are core mutual values and have been key to the success for our industry for 250 some years,” Chamness said. Chamness finds mutual carriers themselves are catching onto the idea that their model appeals to people who may prefer Main Street to Wall Street. “As we look at brand awareness for the mutual space, we’re encouraged that NAMIC members are really selling on the core value of being mutual and beginning to explain to policyholders why being mutual makes a difference and why they should consider buying insurance from a mutual insurance company,” he said. Carriers are positioned to reap the benefits in recruiting as well as in sales. “Mutuals have a particularly strong value proposition that resonates with this millennial generation. Our industry provides meaningful work, and mutuals add the benefit of community that millennials value,” he said. Wells Media editors Andrew G. Simpson, Stephanie Jones, Amy O’Connor and Elizabeth Blosfield spoke with top mutual executives for their views on growth and related hard and soft issues. How do you get them back? “Companies bring them in early, make sure that they stay in contact with them through college, often providing summer employment, and then they get them back with an offer the day they graduate,” he said. 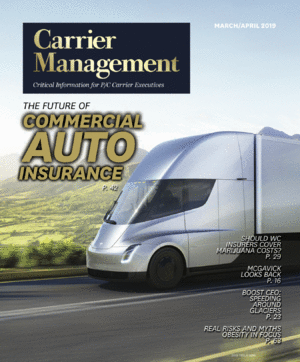 Industry analysts see autonomus vehicles as a threat to the entire industry, not just mutuals. But Chamness isn’t worried, yet.